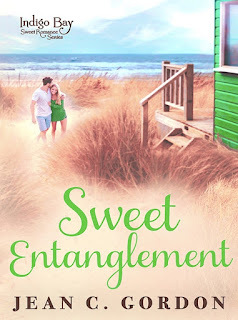 This month I'm sharing my excitement about being part of the Spring 2018 launch of the Indigo Bay Sweet Romance series with an excerpt from my Sweet Entanglement. It releases next Monday, June 11 (available for preorder now). What is the Indigo Bay Sweet Romance Series? It’s tons of fun for readers! But more specifically, it’s a set of books written by authors who love romance. Grab a glass of sweet tea, head to the porch, and get ready to be swept away into this charming South Carolina Beach town. The Indigo Bay world has been written so readers can dive in anywhere in the series without missing a beat. Read one or all—they’re all sweet, fun rides that you won’t soon forget. Also as special treats, you’ll see some recurring characters. Jesse Brewster ran his tongue around the inside of his mouth and tried to swallow the grit. He didn’t know if it was actual sand from the South Carolina beach he tried to sleep on last night or the tequila shots he’d downed like water after he’d gotten a good look at the monstrosity that was supposed to be his life-saving legacy. “Sir, your public defender is here,” a male voice said. Jesse opened his eyes to the neon yellow walls surrounding him, reflecting back every sharp ray of light from the inside lighting and small window. He squinted against the pain to his head. Someone here at the Indigo Bay, South Carolina, police department had some sense of humor painting the combination interrogation room/holding cell walls bright yellow with royal blue trim. The sleeping block and covers he was sitting on the and the table and chairs were the same blue. “Thanks.” Jesse squinted again at the police officer’s name badge. “Officer Andrews” The man looked vaguely familiar. Probably his arresting officer. That would make sense, him being here for his arraignment. “Coffee will be fine,” Jesse said. He closed his eyes against the yellow and held his head in his palms. What was with all this sir? Jesse shook his head to clear it. The bright paint hadn’t just affected his sight. His ears were also hallucinating. He raised his head. No, his ears were right. It was Lauren. Her voice dripped with disbelief that matched his own. And he’d thought things couldn’t get any worse. “In the flesh.” He flexed his bicep, unable to resist going full obnoxious, in case she still harbored any positive thoughts about who, what he was. By reflex, Jesse patted the back pocket of his jeans. No wallet. A vague picture of it on bar swam before his eyes. Lauren dropped the folder she’d held to the table and pulled out one of the chairs, giving him a moment to study her. He raked his hand though his matted hair. She looked good. But when didn’t Lauren look good? Her crisp power suit did nothing to hinder his memories of the soft curves beneath them. His stomach churned with something that had nothing to do with his excess of tequila. Ben, was it? Jesse’s gaze darted from Lauren to the hallway the officer had disappeared into. He stood, letting the spinning in his head stop before he took the two steps from the sleeping block to the table. What did he care? He and Lauren were over. He’d made sure of that. They’d been growing apart, going in different directions. He didn’t need to get into the direction he’d been headed after his accident and his mother’s death—with himself or anyone else. Jesse looked around. He’d arrived at his destination. There was nowhere to go now, but up. He didn’t get a say? Jesse wasn’t sure he liked this take-charge Lauren. But wasn’t that one of the reasons he’d let her go? So, she could reach her potential, as his Mom might have said. His throat clogged with the loss that would always be too fresh. “Before we go into the court room, I have an ID for your vagrant. Jesse Brewster and I are old friends.” She handed the officer a sheet from her folder. So, they were still friends. Some of the darkness in Jess’s soul lifted, not that meant much. There was plenty left. He gauged the other man’s reaction. Aside from a raised brow, he didn’t have any outward reaction to Lauren’s statement. “Brewster,” the man said, offering his hand. Jesse wiped his gritty palm against the pant-leg of his jeans. “Under different circumstances, I’d say nice to meet you.” He forced a smile. “Yes, yes, I did,” Jesse said tightly, bracing for the judgmental look from the officer and Lauren. “We shouldn’t keep Judge Trexler waiting,” Lauren said. If she’d interrupted for his benefit, because of their friendship, she shouldn’t have bothered. He knew what he’d done, who he was now far better than she did, and he was a big boy, ready to move past it. They walked upstairs to the city hall adjoining the police department and into a large room with rows of chairs facing the court bench. A middle-aged woman sat behind it with another woman seated to her right and a man in a suit standing in front of the bench talking to them. “Judge Trexler, the court clerk, and the city attorney,” Lauren explained as they entered the room. Officer Andrews led Jesse to the front row, where the three of them took their seats, Lauren on one side of him and the officer on the other. The city attorney sat next to officer Andrews. The judge’s voice jerked Jesse’s gaze from where it rested on Lauren’s back. Officer Andrews walked him the few feet to the bench, as if he were going to make a break for it. “You honor.” Jesse nodded in respect. “Guilty.” He had several things he’d like to consult with Lauren about, but his sleeping on the beach wasn’t one. This is the 12th novel in the Indigo Bay Sweet Romance Series, but all books can be read as standalones. 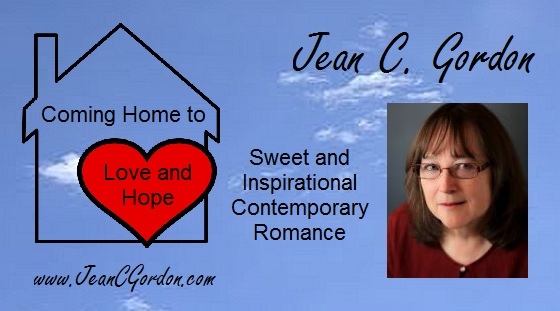 Great excerpt, Jean! This book is a definite winner. How intriguing! It sounds like something interesting is going to happen between Lauren and Jesse.